Thom Yorke surprised many today by handing out copies of the Radiohead’s newspaper, The Universal Sigh, in person today in London. A huge queue of people lined up outside London’s Rough Trade East this afternoon to try and get a copy of the free publication. 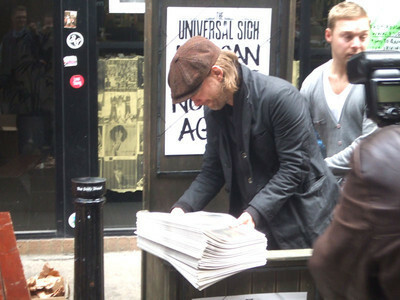 At one point, Thom stepped out of the record store and began handing out the papers to fans to the surprise of everyone. Read more about the event today here. Previous post: It’s our 14th Birthday!